A typical coral reef generally faces the open sea, seaward of which is the fore reef, descending into deeper water and floored deeper down by fragmental material derived from the reef. Behind the growing fore-reef edge, which rises to about mean high-water level, is a shallow platform formed partly by a now dead area of reef framework and partly of fragmental material and often colonized by sea grasses, algal mats, or mangroves. Patches of living framework occur intermittently. Cays may occur along the platform, or the reef may terminate against the shore of a landmass. If there is no immediately adjacent landmass, the reef descends again into deeper water, generally more gently, on this, its leeward side. There are usually live reef frameworks on this slope too, but these are often irregular and patchy. The reef becomes true rock by an almost imperceptible dissolution, redeposition, recrystallization, and chemical transformation of reef material. The shape of coral reefs, while due at least in part to the tendency of reef builders to grow upward and outward toward the prevailing winds and currents, is also the result of changes of sea level during the last 2,000,000 years or more. Coral reefs that developed before the last glaciation were left above sea level, where they were eroded and subjected to solution weathering. As sea level rose again during the last 10,000 years, new reef growth mantled this older, drowned landscape but has still not masked it completely. Originally, Charles Darwin described three main types of coral reefs: fringing reef, barrier reef and an atoll. The first of these types is the fringing reef, an area along the shore where coral colonies have been able to grow. Fringing reefs occur close to land and often extend out to sea for long distances. The second type of reef is a barrier reef, a well defined coral zone separated from land by a lagoon. The lagoon is a shallow area with a sandy floor, patch reefs, and patches of seagrass. 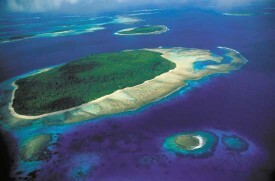 An atoll is the third type of reef. An atoll is a ring-like formation of reefs with a lagoon inside the ring. According to Darwin, barrier reefs begin as fringing reefs along the shores of a volcano. Over millions of years, the volcano sinks lower into the sea and the sea level rises around the volcano. The coral grows upwards to keep from getting too far from the sunlight at the sea surface. The outward side of the coral reef grows fastest since ocean currents bring in the plankton that the corals feed on. The water on the landward side of the reef is still and there is less oceanic plankton. Here the reef is unable to grow fast enough to keep up with the rising sea level and is eventually drowned. A lagoon develops between the reef and the land, resulting in the characteristic barrier reef shape. The volcano continues sinking until it disappears under the sea surface. 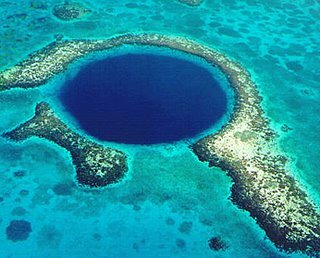 The result is an atoll, a ring of coral reefs surrounding the submerged, extinct volcano. Eventually sand is trapped by the reefs and sandy islands, called cays, appear. The word "keys", as in Florida Keys, derives from the Spanish word "cay." Nowadays, following coral reef types are recognized: Apron reef, Fringing reef, Barrier Reef, Platform reef, Ribbon reef, Table reef and Atoll Reef. Apron reef - short reef resembling a fringing reef. The apron reef also extends farther out and grows in a downward fashion, which is also connected to some sort of peninsular shore. Fringing reefs are relatively young. They can develop in shallow waters along the coast of tropical islands or continents. The corals grow upwards to sea level or just below and outwards towards the open ocean. Fringing reefs are generally narrow platforms a short distance from shore and don't contain a substantial. Barrier Reef - A coral reef growing parallel to the coastline and separated from it by a lagoon is called a barrier reef. The lagoon may develop between the fringing reef and the land. As the reef continues to grow further and further offshore it eventually reaches the edge of the continental shelf. Barrier reefs can also originate offshore if the depth of the seabed out there is shallow enough to allow corals to grow. The most famous barrier reef is the Great Barrier Reef in Australia. It stretches over 2300 km and covers over 200'000 km2. It lies between 24 and 240 km from the main continent. Platform reefs are scattered in the calm, shallow waters between the mainland and edge of the continental shelf. They are usually round or oval patches that grow up from the continental shelf. They often tend to be more broken up and do not always present a defined barrier to the sea. Platform reefs usually lie in sheltered seas and quite far offshore. They are flat-topped with small and very shallow lagoons. Patch reef - small patches of reef that tend to grow within lagoonal back-reef areas, an isolated, often circular reef, usually within a lagoon or embayment. Bank reef - isolated, flat-topped reefs that are larger than patch reefs and usually grow on mid-shelf regions and are linear or semi-circular in outline. Table reef - A small, isolated organic reef approaching an atoll type, which has a flat top similar to bank reef, but does not enclose a lagoon. Ribbon reef - long, narrow, somewhat winding reef that parallel the shelf break, usually associated with an atoll lagoon. A ribbon reef flat is commonly only 300 to 450 meters wide from the seaward wall to its lagoonward edge. Its ends may curve leeward and border the passages between it and the next reefs in line. Rarely, there may be an unvegetated sand cay. Atolls are rings of reef, often encircling an island (sand and coral rubble). They typically have a shallow, sandy, sheltered lagoon in the middle. Access to the open sea beyond is through a number of channels. These provide fresh and colder water for the lagoons. Corals atolls are on the top of submarine mountains. These mountains are remnants of volcanos. Once there were fringing reefs around the volcano. As it slowly submerged the corals continued to grow up to the surface of the water. What remained after the volcano became invisible is a ring of coral reefs surrounded by deep ocean. However some atolls were probably formed by rising sea levels rather by the sinking of islands. Other theories suggest that corals colonized eroded limestone formations, so called karstic saucers.